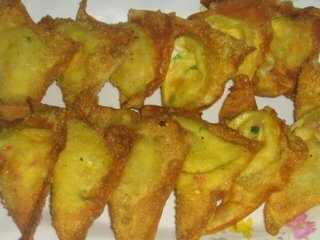 I chanced upon this Crab Rangoon while searching for other recipes on the net. The recipe I saw has ingredients which I personally do not like and it only uses 3 crabsticks. Too little crabstick and too cheesy a mixture for me. I tweaked the Crab Rangoon recipe to suit my tastebud. Mix cheese, crabsticks and spring onion together. Add salt n sugar to taste. Spoon mixture onto middle of wanton skin, fold and seal the sides with water. Heal oil in a frying pan and fry the crabsticks. The wanton tastes good when dip in mayo and chilli sauce.